Quite frankly, there were times during June of 2014 when I wondered if I would ever catch another musky. For the second consecutive year, the northern part of the musky’s range experienced late ice-outs, which essentially delayed the whole musky “season” by a month. For several difficult weeks, the regulations book said it was legal to fish for muskies but the fish were mostly no-shows — they were still in a post-spawn funk and just weren’t ready. Fishing improved with time and when the season was over I had enjoyed a pretty good year. For me, the “bite” improved in the middle of July and carried into fall. When it was over, however, I was left wondering what could have been had the fish started hitting normally. Steve Heiting pulled this good musky from the edge of rushes in a shallow bay. I’m well aware that many musky anglers do well in the early morning hours, but that tends to occur in summer. Early in the season, as a rule, the warmer the water the better the musky action. Overnight temperatures can be very cool in the spring, and water temperatures consequently fall. I prefer to sleep in, enjoy a leisurely drive to the lake, and launch somewhere around 9 a.m. By then the sun should be on the water and temperatures should be climbing. Because solar heat is so important to post-spawn muskies, the best fishing tends to occur during the afternoon hours into the early evening. When the sun hits the tree tops you can expect musky action to set with it. Muskies spawn in shallow water and, once they’re done, they feed on the prey species that spawn in the same places after them. It makes sense that muskies would stay shallow after the spawn because their food is there, and the water is warmer. Prime spawning areas are shallow bays protected by landforms or islands from cold main lake water. The best tend to be on the lake’s north side. You will often find dead or newly-emergent weeds and bulrushes, and fallen trees, and the best spots have an incoming stream which adds current and relatively warm water. Great Lakes and Leech Lake strain muskies spawn in more open, sandy areas that contain chara (also known as sandgrass). Regardless of where they spawn, muskies will use the available cover to ambush spawning preyfish. And, the cover will absorb heat from the sun, another attractant. During the summer and fall, my musky plans almost always involve fishing in the wind. I like how wind makes musky location predictable, and the most active fish will position with their noses in it. Big fish often find an eddy where they don’t have to fight water movement yet can still use the current to feed. When musky season first opens I usually try to avoid the wind as it can move cooler, main lake water into shallow areas. Finding the warmest water can mean everything to early season musky action, and for this reason the best spots usually are protected from the wind. Non-feeding muskies tend to be a lot like us. When we don’t feel like eating we’ll pass on a big meal, but if there’s a bowl of chips within reach we’ll probably grab a couple. Muskies see small baitfish just as we view chips. Even if an early season musky is hungry it may still be a sluggish. Maybe it is still somewhat sore from spawning or maybe it isn’t quite comfortable in the current water temperature. Who knows? All I know is smaller musky baits often rule when the season opens. In northern Wisconsin where the musky season opens the Saturday of Memorial Day weekend, the first bait out of my tackle box will be some kind of flat-sided twitchbait, like a 7-inch Slammer or Baby ShallowRaider. Not only is the bait small, but with hard plastic sides and lots of sharp hooks, you won’t miss many strikes. They also should be twitched — their flash is especially effective on indifferent muskies. If muskies prove to be active, small bucktails like the Mepps Musky Killer allow you to fish faster and cover more water. I prefer to stick with small baits until I hear reports of muskies grabbing hooked walleyes. At that point, I figure I might as well use bigger baits. A lot can change in the muskies’ world in just a few weeks. In a normal year, anglers can have remarkable success with big lures if the conditions are right. The muskies’ mood in the spring can be particularly unpredictable. If what you’re doing isn’t working, you need to exhaust every possibility. So far I’ve preached against fishing in the wind while looking for the warmest water, but there are exceptions to the rule. A few years ago my friend John Stellflue and I had caught one musky and weren’t seeing much until we decided to fish in the wind. Within a few casts the first fish we’d seen in hours slammed John’s Musky Killer. We ended the day with nine fish, eight of which were caught on small bucktails in the wind. Muskies in extreme shallow water will readily take something from the surface any time of year, so forget the theory of waiting to use topwaters until ducklings begin hatching. That said, more subtle topwaters like Jackpots and large Zara Spooks tend to be more effective than a loud tail-spinner like a TopRaider or Pacemaker. Make bomb casts and twitch the bait slowly. If you spot the fish before casting, throw well past it and work the lure toward its face. One musky opener, the first fish I hooked (and lost) was a 50-inch-class fish that clobbered a Jackpot over a sand flat near the mouth of a tiny stream. By the time musky seasons open in the North most years, spawning should be in the past and fish are moving on. I will start fishing in the spawning areas, but if I’m not seeing any muskies or only small fish are present, it’s time to look elsewhere. This pattern is not so much water temperature-related as it is a matter of timing. If muskies finished spawning at least two weeks before the season opens, they’re probably beginning to feed. A key spot is a deep hole in a spawning bay because often it will hold a big female musky recuperating from the spawn. Check the points at the mouth of the spawning bay and any islands, fallen trees, humps or points located within a short swim. If you can’t find muskies there, try main lake structure because muskies may be farther along in their seasonal patterns than you think. 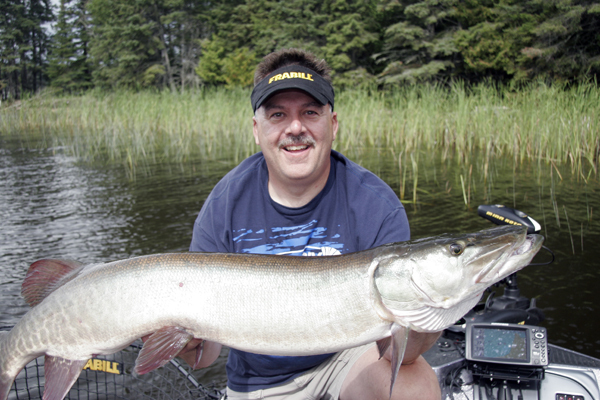 Big muskies can be quite vulnerable when they first slide onto a main lake spot. Another place to check is the nearest deep water basin area, or cast away from the structure you’re fishing rather than toward it. Muskies that spend most of their lives in open water areas may return to them immediately following spawning, and they’ll tend to hang just a couple feet down where the water is warmest. Keep your lures high in the water column. Early season muskies tend to be very catchable because they are in predictable locations and haven’t seen lures since last fall. Will you be ready? When everything you think you know about musky fishing tells you muskies should be there and they aren’t, well, you start to wonder just what the fish are waiting for. And that’s exactly the dilemma I was facing last August.